Monday 18th – Indoor Meeting at the Church Hall, Burwash, TN19 7HA. Monday 15th – AGM Annual Meeting in Church Hall, Burwash, TN19 7HA. Time: 10.00am for a 10.30am start. Soup and rolls will be provided by Hanka!!! Come and have your say about anything on your mind – It’s your group. Thursday 18th – Small group of AB volunteers to set up Chalvington for driving next week. Time: 10.oo-10.30am for less than 2 hours. Thursday 25th – Possible first driving at Chalvington for Thursday members. Please watch this website for last minute poor weather cancellations. Monday 29th – First driving at Chalvington. Thursday 2nd – Driving at Chalvington for Thursday members. Monday 6th – Early Spring Bank Holiday, so no driving at Chalvington. Thursday 9th – Driving at Chalvington for Thursday members. Monday 13th – Driving at Chalvington. Thursday 16th – Driving at Chalvington for Thursday members. Monday 20th – Driving at Chalvington. Thursday 23rd – Driving at Chalvington for Thursday members. Monday 27th – Spring Bank Holiday, so no driving at Chalvington. Thursday 30th – Driving at Chalvington for Thursday members. Monday 3rd – Driving at Chalvington. Tuesday 5th – Bradbourne – Carriage Driving Regional Qualifier. Bradbourne Riding and Training Centre, Bradbourne Vale Rd, Sevenoaks, TN13 3DH. Thursday 6th – Driving at Chalvington for Thursday members. Monday 10th – Driving at Chalvington. Thursday 13th – Driving at Chalvington for Thursday members. Monday 17th – Driving at Chalvington. Thursday 20th – Driving at Chalvington for Thursday members. Monday 24th – Driving at Chalvington. Thursday 27th – Driving at Chalvington for Thursday members. Monday 1st – Driving at Chalvington. Thursday 4th – Driving at Chalvington for Thursday members. Monday 8th – Driving at Chalvington. Thursday 11th – Driving at Chalvington for Thursday members. 12th-14th – RDA World Championships at Hartpury (Kipling not competing this year). Monday 15th – Driving at Chalvington. Tuesday 16th – Hadlow College Driving Show (This replaces Felbridge). Hadlow College, Bourne Grange Lane (off Tonbridge Road), Hadlow, TN11 0AL. Thursday 18th – Driving at Chalvington for Thursday members. Monday 22nd – Driving at Chalvington. Thursday 25th – Driving at Chalvington for Thursday members. Monday 29th – Driving at Chalvington. Thursday 1st – Driving at Chalvington for Thursday members.
? Saturday – Open Day at Chalvington for Monday & Thursday members. Monday 5th – Driving at Chalvington. Thursday 8th – Driving at Chalvington for Thursday members. Sunday 11th – The Oaks Driving & In Hand Show. Broad Farm, Hellingly, BN27 4DS. Monday 12th – Driving at Chalvington. Thursday 15th – Driving at Chalvington for Thursday members. Monday 19th – Driving at Chalvington. Thursday 22nd – Driving at Chalvington for Thursday members. Monday 26th – Summer Bank Holiday, so no driving at Chalvington.
? Thursday 29th – RDA Heron’s Ghyll “One Day Event” (Date not yet confirmed). Burchetts Farm, Whitesmith Lane, Whitesmith, BN8 6HA. Monday 2nd – Driving at Chalvington. Thursday 5th – Driving at Chalvington for Thursday members. Monday 9th – Driving at Chalvington. Thursday 12th – Driving at Chalvington for Thursday members. Monday 16th – Driving at Chalvington. Tuesday 17th – South-East Indoor Competition @ Sands Farm. Please avoid Warnham Village and follow the signs from A29 or A24 to Equestrian Centre. Thursday 19th – Driving at Chalvington for Thursday members.
? Thursday – Peter’s Golf Day, for his golfing friends. Monday 23rd – Driving at Chalvington. Thursday 26th – Driving at Chalvington for Thursday members. Monday 30th – Driving at Chalvington. Thursday 3rd – Driving at Chalvington for Thursday members. Monday 7th – Driving at Chalvington. Thursday 10th – Driving at Chalvington for Thursday members. Monday 14th – Driving at Chalvington. Thursday 17th – Driving at Chalvington for Thursday members. Monday 21st – Driving at Chalvington. Wednesday 23rd – 2019 Regional Conference. The Haven Centre, Hophurst Lane, Crawley Down, RH10 4LJ. 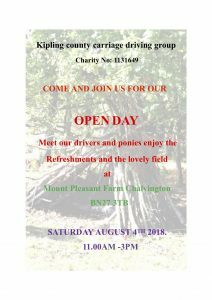 Thursday 24th – Driving at Chalvington for Thursday members. Monday 28th – Driving at Chalvington. Thursday 31st – Driving at Chalvington for Thursday members. Sheepcote Lane, Chalvington, BN27 3SY. Co-ords: 50.86846, 0.17382 Because it is becoming colder this may be the last Thursday driving day. Please watch this website for updates. Monday 4th – Driving at Chalvington for Monday members.
? Monday – Christmas Dinner for all of our Monday & Thursday members. The Bear Inn, High Street, Burwash, TN19 7ET. Monday 5th – Special meeting at the Church Hall, Burwash, TN19 7HA. This is a special meeting to explore ways of continuing and supporting the Thursday carriage driving (in addition to our regular Monday driving meetings). The proposal is that these meetings will support Zena’s members and be held at Chalvington as we are no longer able to drive at Stonegate. Monday 19th – Social meeting at the Church Hall, Burwash, TN19 7HA. Monday 2nd – Easter Monday Bank Holiday, so no driving at Chalvington. Tuesday 3rd – Training Day at Hadlow College. Monday 16th – AGM Annual Meeting in Church Hall, Burwash, TN19 7HA. Thursday 19th – Small group of AB volunteers have agreed to set up our field ready for driving next week. Time: 2.30pm for approx 2 hours maximum. Monday 30th – No driving at Chalvington due to heavy overnight rain. Monday 7th – Early Spring Bank Holiday, so no driving at Chalvington. Thursday 10th – No driving at Chalvington this day. Monday 28th – Spring Bank Holiday, so no driving at Chalvington. Monday 4th – Driving at Chalvington. Thursday 7th – Driving at Chalvington for Thursday members. Sunday 10th – South-East Indoor Competition @ Bradbourne. This is an alternative regional carriage driving event qualifier for 2018 Hartpury in Gloucestershire, and is being run by Sara Howe. Monday 11th – Driving at Chalvington. Thursday 14th – Driving at Chalvington for Thursday members. Monday 18th – Driving at Chalvington. Thursday 21st – Cancelled – Driving at Chalvington for Thursday members. We are sorry but ensure the safety of our Thursday members we regret that we have had to cancel this one day’s driving (only) due to insufficient AB Whips and volunteers. Monday 25th – Driving at Chalvington. Thursday 28th – Driving at Chalvington for Thursday members. 14th-15th – RDA World Championships at Blandings. Blandings Farm, Badlingham Road,Chippenham, Cambs., CB7 5QQ. Kipling County’s Jo driving Texas (with Andrea supporting) competes for a Para place. Monday 30th – NO DRIVING DUE TO OVERNIGHT & CONTINUING RAIN. 08.28am We apologise for the late notice, but due to continuing rain, Zena feels it is safer for her group if we cancel today’s meeting. 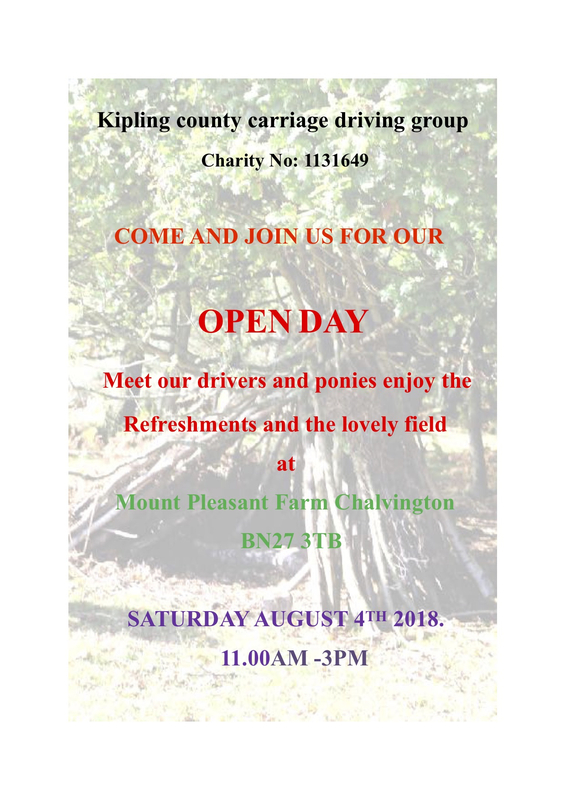 Saturday 4th – Open Day at Chalvington for Monday & Thursday members. Monday 6th – Driving at Chalvington. Thursday 9th – NO DRIVING FOR THURSDAY GROUP DUE TO RAIN. 08.00am We apologise for the late notice, but Zena feels that because of the continuing rain it would be safer our Thursday members if we cancel today’s meeting. Sunday 12th – The Oaks Driving Club Show. Val asks if we could meet up around 9.30am ready for 10.30am start. Monday 27th – Summer Bank Holiday, so no driving at Chalvington. Thursday 30th – RDA Heron’s Ghyll “One Day Event”. Please contact Val for meet up times. Wednesday 12th – First Aid Course & Refresher. Location: The Wheel Inn, Heathfield Road, Burwash Common, TN19 7LA. Judy has kindly arranged for a qualified First Aider to provide a refresher/course for our Monday & Thursday volunteers and AB Whips. It will be a full day with a lot of laughter, and the only physical requirement is that you must be able to kneel in order to carry out artificial respiration. We will need 10 people in order to ensure the day is financially viable, Please contact Judy for any concerns. Thursday 20th – Peter’s Golf Day, for his golfing friends. Tuesday 25th – South-East Indoor Competition @ Sands Farm. This competition is also a qualifier for Hartpury in Gloucestershire. Wednesday 17th – Regional Conference at The Haven Centre, Crawley Down. If you wish to attend please let Hanka know asap as she has to send a list. Our committee feels that this event should be deferred until next Spring. Because it has become really cold, our committee has agreed that this will be the last driving day for 2018. Zena will now take her members swimming through the winter. Monday 10th – Christmas Dinner for all of our Monday & Thursday members. The Bear Inn, High Street, Burwash, TN19 7ET. 12.00 for 12.30 start. Hanka has managed to obtain a discounted price of £14.50p which is excellent. Please let Hanka know your attendance as soon as possible. A very Happy New Year to everyone, and we look forward to seeing you driving next year!